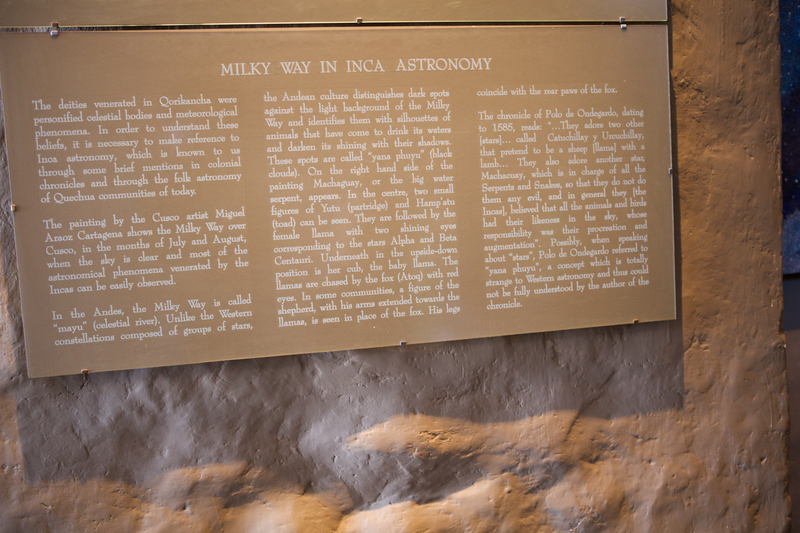 One interesting thing I picked up from our visit to Qorikancha was that unlike the European astrology, which traces the stars to find deities, the Incan constellations find patterns in the darkness around the stars. 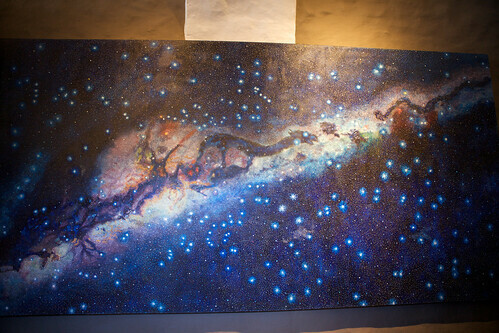 This representation of Incan Astrology was painted by Miguel Araoz Cartagena, a local artist in Cuzco. To read more about the constellations, read this. It's a fine line between being an open-minded eater and being the idiot who'll eat anything on a dare. I try to be adventurous enough that I don't miss a good meal due but not so much that I'm just eating something because it's there. In Peru, cuy was the elephant in the room. Guinea pig is a local delicacy that I admit had me both curious and a little grossed out. Really though, when was I going to have the opportunity to try it again. 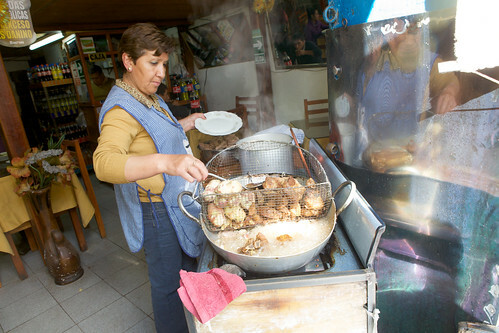 In Aguas Calientes, I almost had cuy confit at The Tree House But they didn't have any on hand. I didn't go hunting for cuy after that, but I mentioned that I wanted to try it to Arturo, a friend of a friend, who leads food tours in Lima (more on that later). 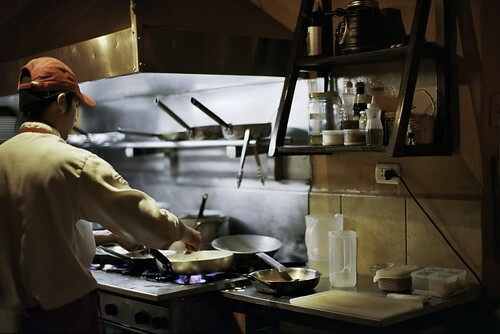 He recommended Victor Victoria, a small restaurant that's small, divey and off the beaten path. We got totally lost the first time we tried to go there, but managed to track it down the next night. Joined by fellow anglophones from Brooklyn and the UK that we met at an Aussie bar down the road, we dove in together and had a pretty good meal. Peru is known for it's textiles and weaves and materials, so it's no surprise that we ended up at the craft museum in Cuzco. 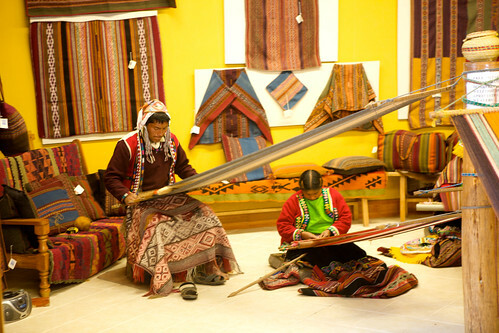 While Tammi shopped for "gifts" (ahem), I headed to the back of the shop to see weaving being done by hand. Take a look after the jump. 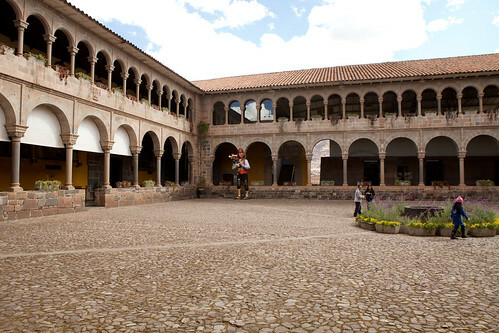 In what was probably the last historic site I laid eyes on over my month long trip to South America, Tammi and I visited Qorikancha, the site of a former Inca temple, which was inevitably looted by the Spaniards and turned into a church. This isn't much a sightseeing blog, so I'll let you read the Wikipedia entry for details and stick with the visuals after the jump. Our trip to Peru wasn't all eating and hiking - Tammi and I did some sightseeing while we were in Cuzco, too. It just so happens that as we walked to the remains of an ancient inca temple, Qorikancha, we ended up walking down a strip of chicharrones joints. Go figure. Baskets of freshly fried pork bits were on display in front of each of these places. How could we resist? Culture could wait. Get a look after the jump. While the eating options were a bit limited in Aguas Calientes, Cuzco was an entirely different story. 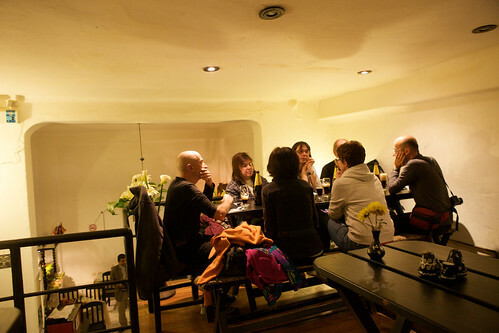 One night, while looking for a place to grab a drink, we stumbled upon Cicciolina, an Italian place hidden in a courtyard of shops a block or two away from the main square. We may have come for a drink, but as soon as I saw that our spot at the bar was directly in front of the open kitchen, it was pretty clear that we'd be spending hours there. See cooks, prep, pasta making and cocktail shaking after the jump. 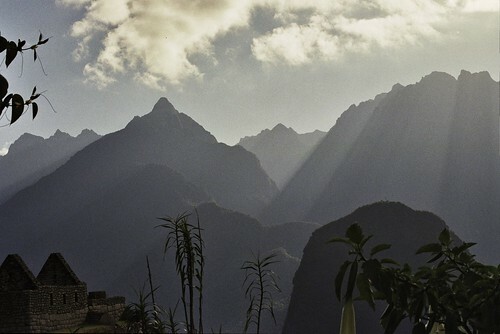 I've finally made my way through my film photos of Peru and have started posting them on my analog tumblr site. 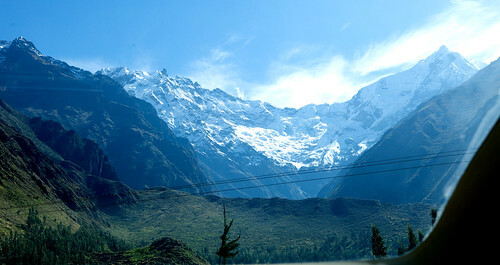 I'm starting with the photos from Machu Picchu and working my way through the rest of the trip. I'll be posting a few every day, so check back regularly. I was warned before heading to Peru that the altitude in Cuzco and to a slightly lesser extent the Machu Picchu area would take its toll on us. Having been gradually acclimatized to the 8,000 foot elevation of Aspen over the years, I was a little skeptical that it would be much worse than a minor headache and a nosebleed or two. It turns out that 11,000+ feet is a whole different experience. Wow, what a week it's been since I posted from the airport in Lima at 4am. We've bounced around Peru and there will be more reports soon, I promise. For regular updates, follow my digital Tumblr blog, where I've been posting photos like mad. 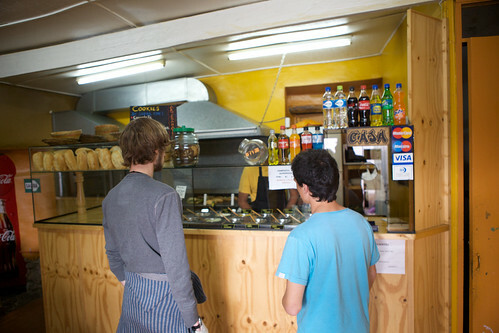 Once we got to Cuzco and settled in, it was time to look for some real food. We huffed and puffed through the 11,000+ foot altitude and tracked down a sandwich shop called Juanito's, which was highly recommended and just a couple blocks from where we were staying.